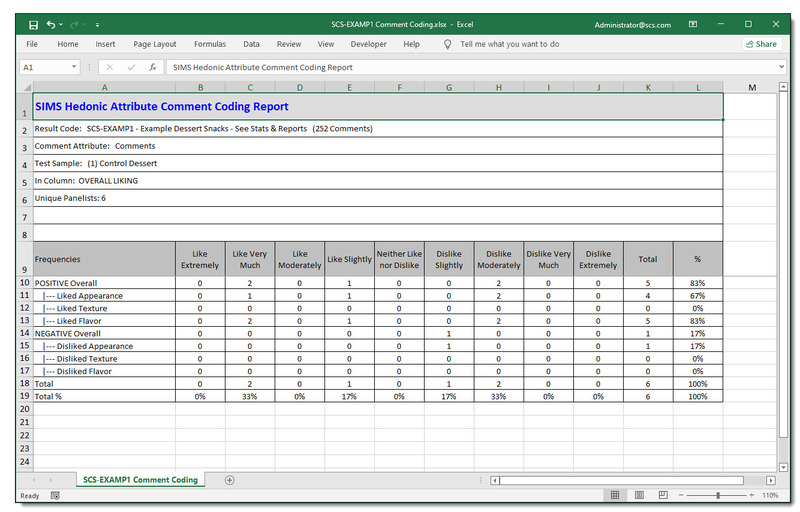 The Comment Coding Reports are a way to categorize and organize open-end comment textual data from Panelists. You create comment trees by quickly interpreting your panelists comments into individual Categories, Themes, and SubThemes. 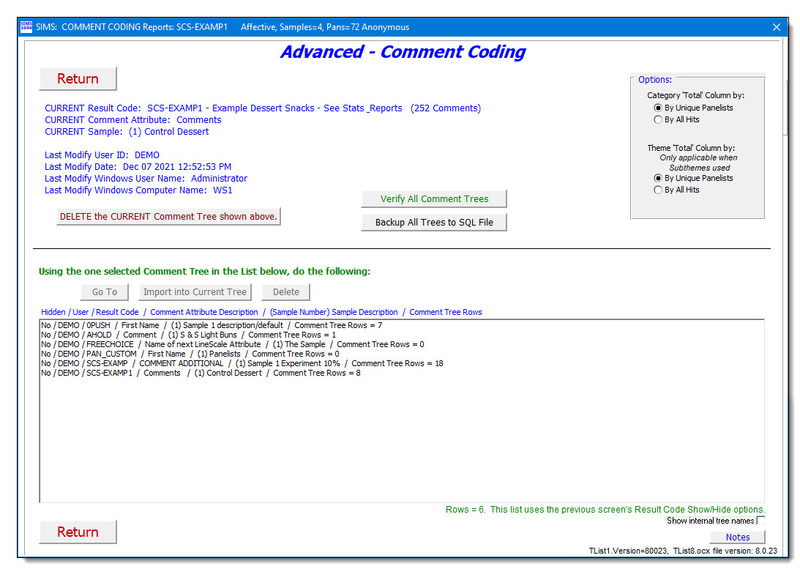 One Comment Tree can exists for each Result + Comment Attribute + Sample combination. 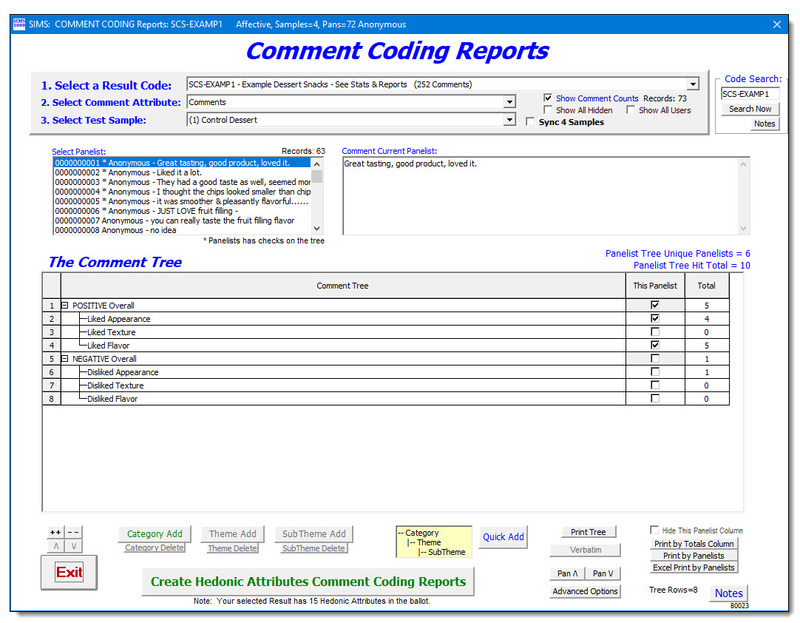 Example SIMS Comment Coding Report Setup Screen. 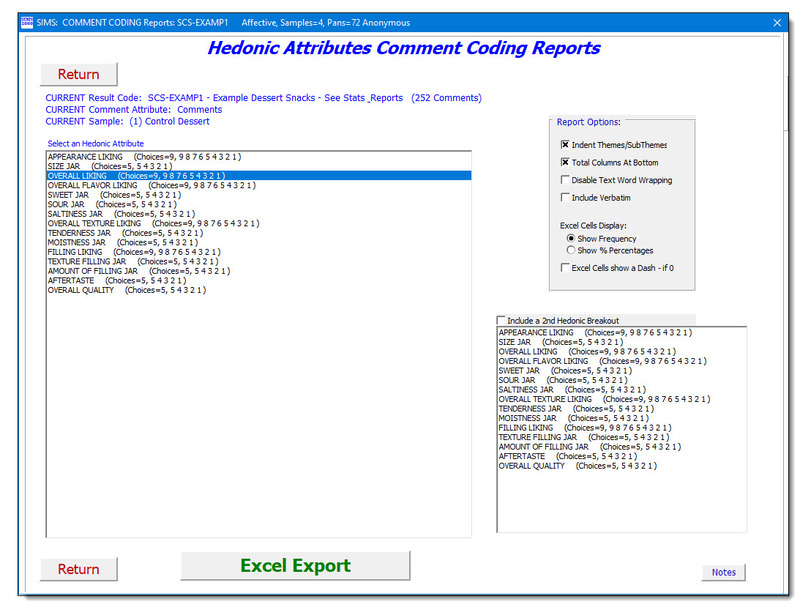 Example SIMS Hedonic Attribute Comment Coding Report Excel Screen. 3. Notes that will be available by Clicking the 'Notes' Button on Main Report Form. comment textual data from Panelists. individual Categories, Themes, and SubThemes. For intersecting your Panelist Comment Coding and an Hedonic Attribute from the Questionnaire. hedonic attribute response frequencies. Optional apply a 2nd hedonic attribute breakout. Your selected demographic hedonic attribute breakouts by choice will appear on the report. the test is a multiple sample test, the demographic hedonic will apply for any test sample. A breakout of the breakouts from the 1st Selected Hedonic Attributes. Pretty advanced report. Excel column count will be increased, Hed1 #choices *  Hed2 #choices. Add two extra rows at bottom, after final Comment Tree row items. These added rows total actual normal frequencies for all unique panelists represented in the tree. Added row #1 totals the actual frequencies response counts, ie. normal frequencies. Added row #2 shows percentages of the actual frequencies response. the values in these two added rows should match exactly with the normal frequency reports. Force single line no wrap display. Some text may extend beyond cell width. The number of actual occurances for hedonic breakouts for panelists in category theme rows. with comments in the test. Thr dashes frequently can give a much cleaner look. columns, are always calculated using By Unique Panelist logic. impacted by the options for Excel Cells Display, Show Frequency or Show %ercentages. Delete the Current Tree shown above. WARNING:  This will permanently delete the Comment Tree shown above. Any Tree Delete occurance generates an event Audit Trail Log in the SIMS database. Administrative function for deep verification of database integrity and logic of all trees. Backup All Trees to SQL File. Administrative function for archival and Sensory Computer Systems debugging. themes are selected under a category. subthemes are selected under a category. WARNING:  This will permanently delete the selected Comment Tree.